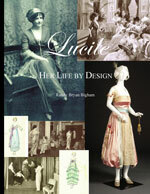 January 2012 sees the eagerly awaited publication of Lucile - Her Life by Design by Randy Bryan Bigham. The author tells this web site that, ‘Lily Elsie is an important presence in the book in keeping with her status as one of Lucile's greatest muses! Lily Elsie is referenced on 15 pages, including a page in my Prologue as well as 4-page, fully illustrated chapter devoted to her, called the "Merry Muse." And there are 13 images of her, several in colour, and two are full page. 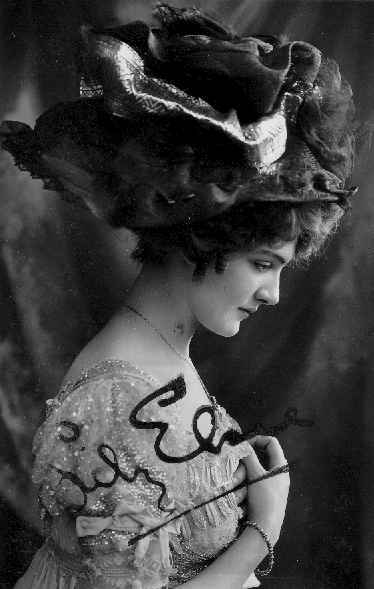 In addition to Elsie, contemporaries Gertie Millar, Gabrielle Ray and Ellaline Terriss are referenced and photographed. Lucile Dresses worn by Elsie. 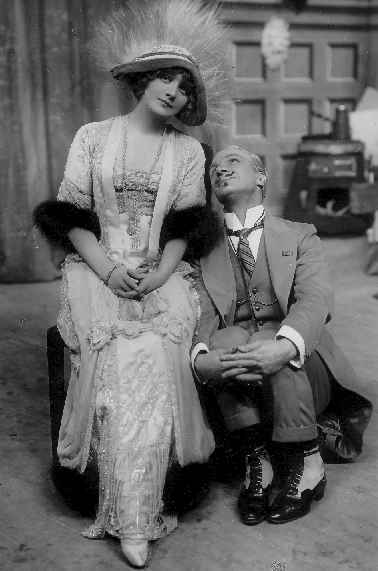 These descriptions were originally published in the "Frocks and Frills" column of The Play Pictorial (1907 and 1911 issues) and were later quoted by Cecil in his Book of Beauty (1930). This book contains many sketches by Beaton of his (and our) adored Elsie. "... Their colour scheme throughout is really beautiful and it is worth notice to mention that all the gowns in the first and third acts are, without exception, made in the Empire style with high-waisted bodices and long trailing skirts. How well they suit the tall graceful Daly girls and the Daly stage..."
"...Lovely Miss Elsie, of the Merry Widow Waltz fame, is of course especially favoured in her frocks. In the first act she is gowned in what appears to be woven sunshine but it is in reality a shimmer of silver and gold embroidery over oyster-white satin. There is a foam of palest pink tulle edging the décolletage of the Empire bodice and huge shoulder knots of the same. A loose rose pink wrap adorned with bands of silver and careless knots of rosebuds accompanied this gown ..."
"... In the third act Miss Elsie returns to modern dress and wears a clinging white chiffon Empire gown over pale pink satin. There are gleams of silver on the long trailing skirt which is beautifully embroidered round the hem with pink and blue chiffon blossoms. The shot silver sleeves and the low-cut bodice are edged with tassels and knots of palest blue net. With this gown she also wears an old-rose satin coat and an immense black crinoline hat, banded round the crown with silver and two huge pink silk roses nestling under the brim. Oh! 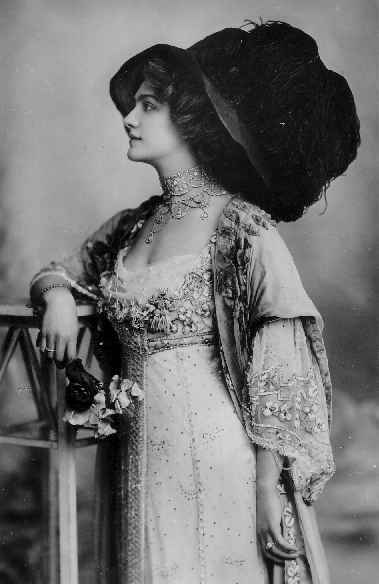 The sensation of the Merry Widow Hat! 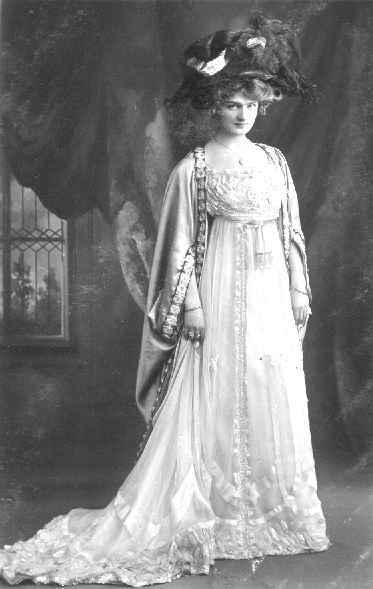 ..."
"... Miss Elsie's first act Lucile garment was in her favourite blue, most elaborately embroidered in silver and white. The lower part was a cascade of silver bugles and little crescents of pink and blue flowers peeping in and out round the hem of the skirt. There seemed to be two or three transparent skirts, the overdress just giving a tantalising glimpse, when it opened at the side. The effect of the mauve over the blue was delightful. The dress was worn with a hat (from Mrs. Ansell) of pale blue osprey. A large pillow muff of alternate pink satin and brown fur was carried when Miss Elsie first appeared and the touch of pink against the blue was most effective ..."
Many thanks to Randy Bigham for compiling this page.